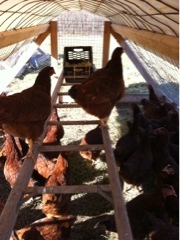 About 6 months ago this flock of hens: Rhode Island Reds, arrived on the farm. They were day old peepers when they arrived, little balls of fluff that went straight into the brooder. A heat lamp kept them warm until they grew a bit, and eventually they went outside in a pen on the grass. Then they moved into a tall pen, and received a roost. Yesterday the nest box went in. There have been a few eggs laid in the grass so we know they are ready to begin egg production. The slight change in the pen got them all chittery...much conversation, nest fluffing and inspection, and then compacting into a nest occurred.